Context beyond news headlines, economy and society behind figures. Manufacturing and employment are changing: “Iran, today and tomorrow” is an overview of a changing country. Written by Stella Morgana, PhD candidate at Leiden University. What Iran's influence over the region means and why religion does not really matter to the sectarian polarization within the Middle East. Journey to the gargantuan Tehran Book Garden. Why opening it now? Iranians read “too little,” and the authorities build a 65 thousand sq m Book Garden. What does this mean in a country where, in spite of the censorship, the literary production is growingly intense? US President did not certify the Iran Deal and announced new sanctions against the Iranian Revolutionary Guard Corps. Congress will have the last say. In his attempt to sabotage Tehran’s growing geopolitical weight in the region, Trump is fuelling the Middle Eastern turmoil: he plays into the hands of the Iranian hawks, and fosters the Saudi-Iranian rivalry. Strategic partnerships, financial cooperation, global and regional businesses: thanks to the nuclear deal the Islamic republic escaped its isolation. Thus, while Washington is threatening to sabotage the Iran Deal, Tehran is not willing to lose the benefits of its return into the international arena. A portrait of the Iranian Foreign Minister Javad Zarif, a great diplomat and Iran Deal architect. He is the most beloved politician among Iranian Reformists and recently labeled Trump’s speech as unworthy of a reply. Trump’s attack to the Iran Deal during his first speech at the UN contributes to create the Iranian enemy in the US, as much as it fosters the image of the Great Satan in Iran. This ideological polarization benefits the hawkish factions in both sides. Yet, Tehran is not prone to give in to the Deal’s economic advantages. "That time when a generation could stand on its own feet is over. Our generation cannot do it." Mehdi is 36 years old, educated, he pursues his dream of becoming a well-known documentary filmmaker. The last time we met was a few weeks ago, in a café in central Tehran. Strategic acrimonies in the Persian Gulf, and particularly between Iran and Saudi Arabia, are constructed through Self vs Other perceptions and representations – together with recent (and past) key historical facts. In which direction is Iran's economy heading after Hassan Rouhani secured his second term as the president of the Islamic Republic? One of Rouhani's main goals is reducing Iran's dependence on oil revenues, diversifying the economy and solve the unemployment problem. However, the president's plan embraces a risk: it is based on neoliberal policies that foster the private sector in order to boost the domestic growth. But this too rapid growth may impact negatively on social inequalities. Hassan Rouhani secured his second term as president of the Islamic Republic of Iran. He will have to face three main challenges: 1) domestic (economy and unemployment); 2) international (following the Iran deal path in the Donald Trump's era), regional (accelerating diplomacy and soft power in the Middle East, trying to keep the balance with its "natural rival": Saudi Arabia). “If the election were held today, who would you vote for?”. Less than ten days before the Iranians will vote to determine who will be the next president of the Islamic Republica new IPPO Group poll of voting intentions in Iran shows that there is a relevant percentage of undecided. In Iran, elections are always full of surprises. Many unexpected results have been produced since the 1990s, and since early 1980s, every president has won a second term. On May 19th, Iranians will go to the polls. They will choose the country’s next president. It was the beginning of August 2012 in Iran. Mahmoud Ahmadinejad was president. The national Tv stations were urged not to broadcast any images of people eating chicken. The government was distressed because of food prices – chicken in particular – which had tripled since 2011. 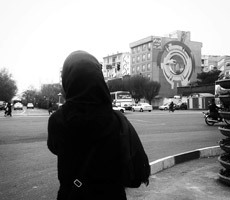 Gender, religion, geopolitics: Iran is often trapped within this three-fold and narrow framework. Three dimensions, such as the feminine, the religious, the political often enclose the whole debate about the country and flatten out the multidimensional complexities of its society. There is a country that is increasingly urban and less rural. It is young and educated, yet it starts to age. It is a country that is growing and now has 79,926,000 inhabitants, exactly 4.92 million more than five years ago. It is Iran, a reality where families are slowly shrinking and young couples are waiting a few years before marring and having children. It is a country in transformation where singles never married decrease, but at the same time the number of divorced women increases. On February 12th, the Iranian television announced car production performances in the Islamic Republic, jumped by 40% in less than a year. Those were the days of the Fourth Automotive Industry International Conference, held in Tehran. Citroën, Peugeot, Scania and Renault participated, among other big brands from Turkey, Germany, Spain, Italy, Japan. Moazzami Mansour, head of the Industrial Development and Renovation Organization, pledged even better numbers and mentioned more than a million cars produced by the end of March. Tehran is a laboratory. Although often trapped into a narrative that describes it as inert and reluctant to change, it produces new realities, driving the transformation of multiple Iranian identities, it recounts changes in power relations within the urban fabric. It is the public sphere, it is even more private dimension, a border and meeting. In Tehran, urban spaces and gender boundaries intersect and mingle in the streets, in public parks, and especially in theaters and coffee. An arbitrary and vague executive order as that signed by the US president deeply affects the academic world, endangering the education of 12,269 Iranians who legally entered the United States and to which the right to study there could be denied. It is December 27th, 2016. The Iranian newspaper Shahrvand publishes a report from Nasir Abad cemetery. It is located in the suburb of Shahriar, in Tehran Province. In the pictures, by Saeed Gholahoseini, it is possible to see empty tombs, about fifty men and women living inside. Newspapers have dubbed it the "water crisis". Antonio Gramsci, in his Prison Notebooks in 1930, wrote that “the crisis consists precisely in the fact that the old is dying and the new cannot be born: in this interregnum a great variety of morbid symptoms appear".